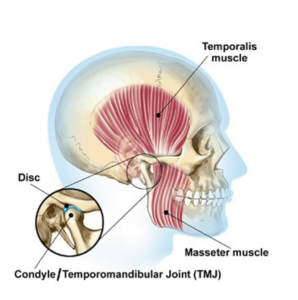 The TMJ is the hinge joint that connects the lower jaw (mandible) to the temporal bone of the skull, which is immediately in front of the ear on each side if your head. The joints are flexible, allowing the jaw to move smoothly up and down and side to side, enabling you to talk, chew (masticate), and yawn. Muscles attached to and surrounding the jaw joint control the position and movement of the jaw. The two main muscles of mastication (chewing) are the Masseter and Temporalis. What is Temporomandibular Disorder (TMD)/ Bruxism and what are the causes? Temporomandibular disorders (TMD) are a complex and poorly understood set of conditions characterised by pain and dysfunction as a result of problems with the jaw, jaw joint, and /or surrounding facial muscles that control chewing and jaw movement. TMD’s results in a large range of symptoms that vary for each individual and can include significant face and neck pain; headaches; damaged or worn teeth and tooth pain; stiff jaw muscles; limited mouth opening’ ear pain and ringing in the ears (tinnitus); as well as painful clicking, popping or grating in the jaw joint when opening or closing the mouth. Bruxism is the term used to describe teeth grinding which is a type of TMD. TMD/Bruxism can be caused by several things and often an individual’s condition has multiple contributing factors. It is vital that you consult your Dentist, who may need to perform various tests, take x-rays, and seek referrals to determine the nature of your condition before undergoing any treatment. How Can TMD/ Bruxism be treated? What are Muscle Relaxant Injections? These medications are sterile, pharmaceutical-grade proteins that target part of the mechanism involved in the muscle contraction. When these medications are administered to a target muscle, the ability of that muscle to contract with the same strength is reduced and often the muscle relaxes. While the medication is eliminated from your body rapidly, the effect will last for several weeks to several months depending on the circumstances. After this time, the effects will completely wear off and the muscle will regain the ability to function as normal. How do Muscle Relaxant Injections work for TMD/Bruxism? After diagnosing that your Bruxism/TMD/Facial pain has a component that is related to the activity of the muscles of the face, your Dentist will determine the dose of medication required depending on the severity of the condition. The medication is administered by an injection into the target muscle from the outside of the face, using very fine, sterile, disposable needles. The injection sites are specifically chosen to target the muscles that are contributing to your individual condition. By reducing the ability of these muscles to contract as forcefully, there is a reduction in the tension in the muscle and the nearby TMJ and surrounding tissue, leading to relief of symptoms, including reduction in teeth grinding and reduction and elimination of headaches. Muscle Relaxant Injections offer a reversible, temporary and minimally invasive treatment option for treating some types of TMD. Many patients report that the injections do “sting a little” while the medication is being administered, however this only lasts a few seconds. Immediately after treatment, the area may be red, bleed briefly and you may experience a slight tingle or itch for a few minutes before feeling completely normal. It is very important that you do not rub or manipulate the area of injection for at least 4 hours. The muscle relaxant will begin to work after a few days and full results may not be felt for up to two weeks. For this reason you should schedule a review appointment with your Dentists two weeks after receiving treatment, at which time a further dose may be required depending on results achieved. You will notice a softening of facial pain and tension, but you will still be able to perform normal jaw and facial movements, with no effect on your ability to eat, talk or smile. Results will last for several weeks to several months depending on individual circumstances. As the effects of the medication wear off, symptoms may return and re-treatment may be required. In some situations, treatment with muscle relaxants does not provide total relief of symptoms. This is usually an indication that there are other contributing factors to the condition and additional therapies may be required. Are there any potential problems? Thank fully these medications have been shown to be very reliable and safe, yet all medications do have the potential to cause unwanted side effects/ complications and you should discuss these with your Dentist. Rest assured that your Dentist will conduct a thorough review of your health and medical history prior to delivering treatment to ensure that you are safe to receive this medication and unlikely to encounter problems. While problems are rare, the most common issues come from the injection process rather than the medication and can include redness, swelling, itching, bruising, bleeding and skin infection. The medication may effect a muscle that it was not intended to, or it may cause excessive relaxation of the target muscles. If this occurs then it is possible that the appearance of your smile, function/ movement of your mouth and how you eat/ speak may be effected. While exceptionally rare, life threatening allergic reactions and problems with other parts of the body are possible. Some people have also reported a general feeling of tiredness or “flu-like symptoms”, including a headache, after receiving treatment. An occlusal splint is small custom made appliance worn over your top or bottom teeth at night to prevent wear from night grinding. Grinding at night (also known as bruxism) is a very common condition, where you clench or grind your teeth during your sleep. Often times, people are completely unaware that they grind their teeth. The symptoms of grinding include waking up with tired jaws or tender teeth where it may be uncomfortable to eat breakfast, regular headaches, poor sleeping where you wake often. If you would like to discuss muscle relaxant injections or occlusional splints, please contact our friendly staff on (07) 3366 1737. Fill in the form below and we'll be in touch to discuss how we can help!